– Andy Bernard, The Office. Athletes can’t fully realize how special their experiences are until they have lived in the real world for a period of time. When looking back, one of things I missed most was traveling every week. Back in college, I thought that traveling on a weekly basis was normal. Imagine being an 18-year-old college student hopping on a private chartered plane being showered with 4-hour-old Subway sandwiches and yellow Gatorade. It allowed me to experience different regions (the mid-west is prettier than people think), people (I loved hearing trash talk from players in Louisiana), and food (I could eat fajitas in New Mexico everyday). It wasn’t until my last year of law school (2013) that I fully could grasp how hectic, crazy, and cool that would be in college student’s life. We would be taking Psych 101 on one day and traveling across the Pacific to play Hawaii the next. The chartered plane only flew into small airports. This allowed the our charter busses (1. Offensive bus, 2. Defensive bus, 3. Special Teams and Boosters bus) to drive straight up to the airplane and take us off to a walk-through (or Run-Through with Nick Holt). The most memorable walk-through we had was before we played Louisiana Tech in Ruston, LA. But instead of driving us to Ruston, our buses took us to the University of Louisiana-Monroe. As we stepped off of the bus, it felt as if I was walking into the Adam Sandler comedy, The Waterboy. Two of the four practice fields bordered a swamp and there were multiple alligators on the far field, but we HAD to get a practice in to warm up our legs. I wish I had a camera phone at the time (but I got suckered into buying the BlackBerry Red World Edition thinking that I’d be worldwide) but even if I did I wouldn’t have dared to go close enough to take a good pic. This was reality. Can you imagine going to practice everyday for a Division 1 program, on a full-scholarship, going to practice everyday worried about being catching a pass and falling into a swamp. I stayed very aware of those gators during the whole walkthrough, we all were. Then it was time for our field-goal unit. Now this unit was led by a comedic group of guys. 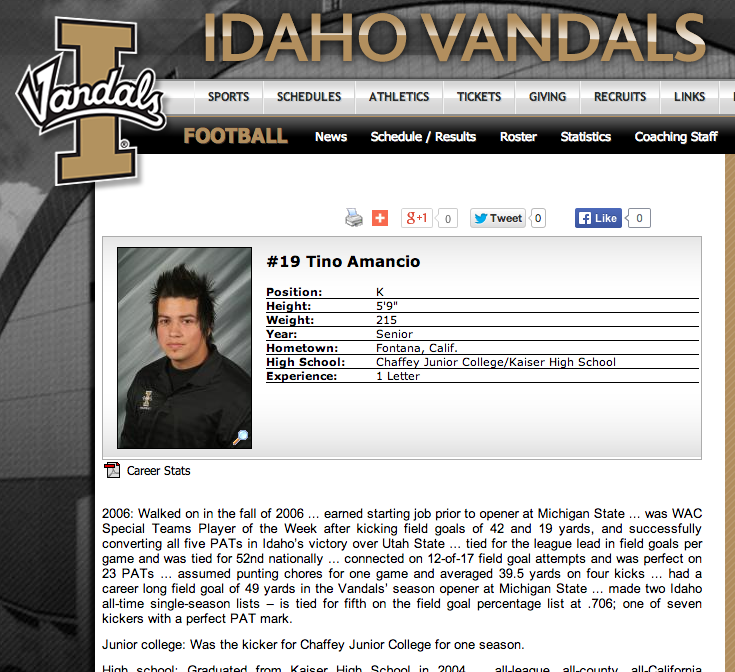 I mean, how can you not have a sense of humor as a kicker… You get called “Kicker” all the time. Our “Kicker” decided, with encouragement from the entire team (guys perpetuate), to kick the ball as far as possible. He launched at least two of our gold engraved footballs into the swamp! After a conversation that I imagine was very similar to the one in The Sandlot, Coach Dennis Erickson and staff decided to let Beast have the footballs. So whenever I find myself in the South, I always eat as much gator as possible. Not because its tastes like chicken, but because I know how unique it is to that region and am happy they aren't roaming football fields in the Bay Area and Idaho.